This amazing tree is part of a new initiative here in Hull called 'Arts In Empty Spaces'. Entitled 'Rainbow-Friargate' this sculpture is part of a three piece installation on the historic Whitefriargate until May 13th. 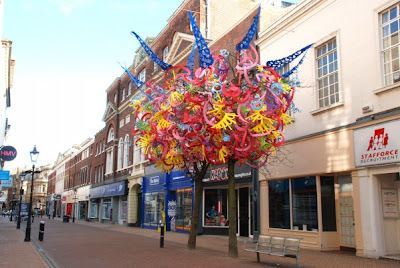 "an intensely colourful site-specific piece adorning two large trees in the middle of the street. Organic cut-out shapes weave in and out of the tree’s branches, connecting upper parts of the two trees together and creating a vibrant explosion of colours, textures and shapes" [quote]. Created by artists Hsiao-Chi Tsai & Kimiya Yoshikawa, London Royal College of Art alumni who have also created 'The Lion' in LDN's Chinatown and 'Futurist Flowers' for Harvey Nichols, the project was commissioned by Hull City Council and Arts Council England, and project managed by the city’s architecture centre, Arc. The aim has been to celebrate and animate this very special part of Hull and forms part of a wider programme of activity aimed at encouraging interest in the city.